Western Whiskey Gazette (WWG): That's a bunch of Bull! That's a bunch of Bull! Yep, a big ol' ornery bull. A Durham bull to be exact. The Durham is an old breed, dating back to late 18th century England. They were initially prized for both dairy and beef production. Later, they were bred specifically for meat production. 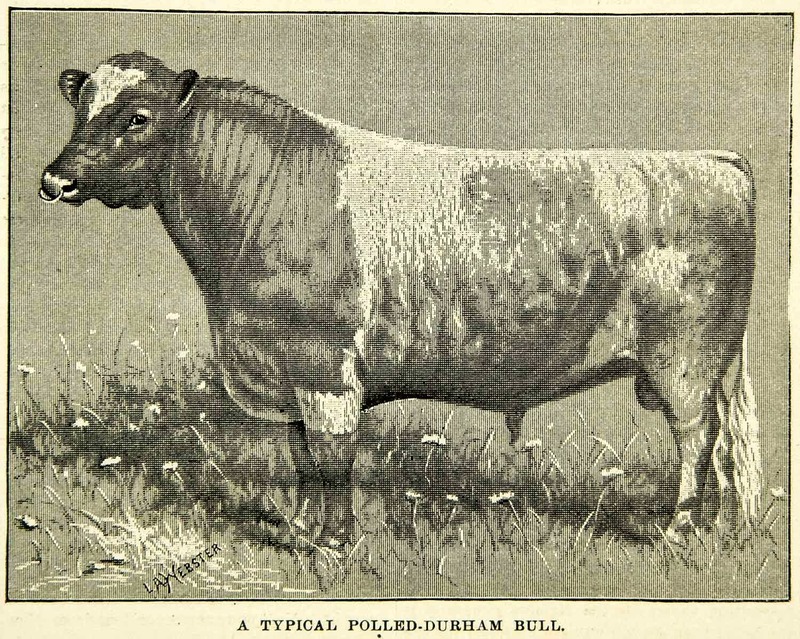 The Durham ultimately became what we now know as shorthorn cattle. According to the US Patent records, the "Durham" brand was registered in 1878 by the firm of ELLISON & HARVEY, who were liquor wholesalers located in Richmond Va. The firm existed from 1870 - 1905, a long span of time in the liquor industry compared to most west coast firms. The firm commissioned an amber glop top cylinder that is unique among whiskies, be they an east or a west coast bottle. The back side sports a raised protrusion that can best be described as the base of another bottle; commonly called a "foot". The "foot" served double duty in that it allowed the colorful label to stand proud of the rest of the bottle, and also allowed the bottle to perch on it's side when employed in less than stable environs, such as the stern and side paddle wheel steam ships of the day. At some point in time, after the creation of the original design, the foot was removed by patching the mold. Subsequent bottles blown were of the more conventional round cylinder form, (sans the "foot"), but the mold repair area can be plainly made out; much the same as the A. Fenkhausen / Old Pioneer Bear amber glop top with the rivet repair plate on the rear, which was blown in San Francisco during roughly the same time frame. 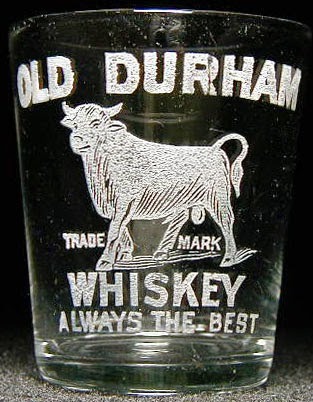 The embossing pattern is attractive and straight to the point; simply "Durham (picture of a Durham bull) Whiskey". The leg on the "R" (in Durham) is straight, the glass is most often shades of medium to darker amber, and the bottle is generally well made without much in the way of crudity. The glass works that produced the bottle is unknown, but a side by side comparison with the word "WHISKEY" on an original E. G. Booz, produced by Whitney Glass Works, reveals an uncanny similarity in embossing patterns. In fact, with the exception of the "S", they bear a striking resemblance to one another. pre-date the brand registration, which occurred in 1878. Later, they had an acid etched picture shot glass produced to advertise the brand. It also sported the now famous bull. 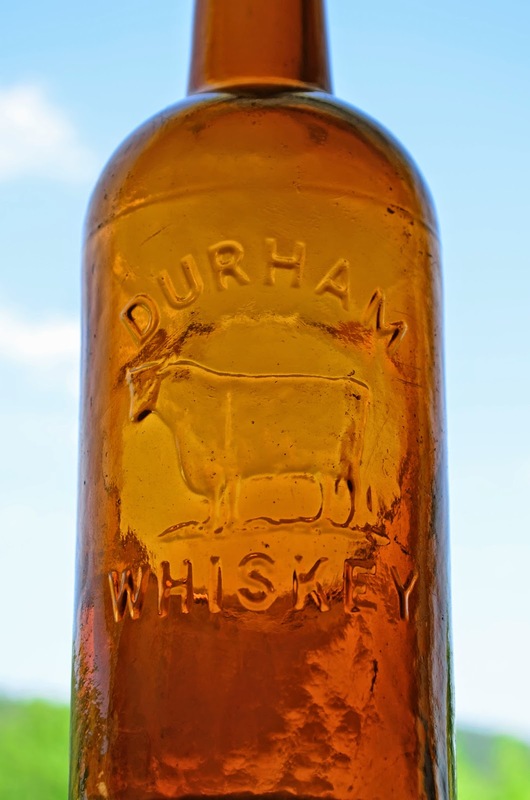 The Durham whiskey bottle was merchandised on both the east and the west coast but the number of examples found west of the Rockies has been slim at best. As far as early glop top whiskies go, the Durham is tough to beat, either with, or without the foot. It may not be in the heavy hitters club that the western "curved leg R" Chielovich Durham is, but for my money, it's one heckuva bottle. PS: We recently acquired a significant and large collection of western glop and tooled whiskies. The Durham was part of this collection. Please feel free to touch base with me if you have a "wish list", as we will be making the collection available for purchase on our soon to be published summer mailing list. Best bet is via email at jsglass@q.com. Thanks and as always, best of luck with your collecting endeavors.